I remember when I read that Khaled Hosseini had another book coming out. After reading (and loving) The Kite Runner (so many tears) and A Thousand Splendid Suns (so many tears) I figured I’d be first in line to force the bookstore to take my money for And The Mountains Echoed. I even wrote a post about the fact that I was excited about the advent of this book. And then I just didn’t read it. The 2015 TBR Pile Challenge, as hosted by Roof Beam Reader, gave me a chance to redeem myself in this respect. Abdullah and his little sister, Pari, are everything to each other. In the wake of their mother’s death shortly after the birth of Pari, Abdullah does everything for her: feeds her, changes her, rocks her to sleep, holds her hands as she learns to walk. The family is very poor and their father, Saboor, works himself to the bone to eke out a living for them. His new wife gives him two more sons but after the older one dies because the winter is a harsh one and Saboor is unable to provide enough to keep them all warm, something has to be done. When Saboor takes his brother-in-law, Nabi, up on his offer, it will have devastating effects that will ripple through the family for generations. At times it felt like this book was more of a collection of loosely related short stories. Each section of the book is another life, another perspective with a common, somewhat tenuous, thread running through them all. All the stories are reflective, most narrators telling their story looking back in time at the decisions they made, the things that happened to them. It seemed to me that most sections boiled down to one life lesson: cherish the time you have with your loved ones because you don’t know when it will end. All the characters in the book are broken too. Some of them are physically shattered, others carry deep emotional scars. One character was hit in the head with an axe, another felled by a stroke; one drinks until the pain goes away, another runs away from life on a small island. All of them have to figure out how to carry on living, forever changed by their pain, trying to find some way to use it to better themselves or the world they inhabit. 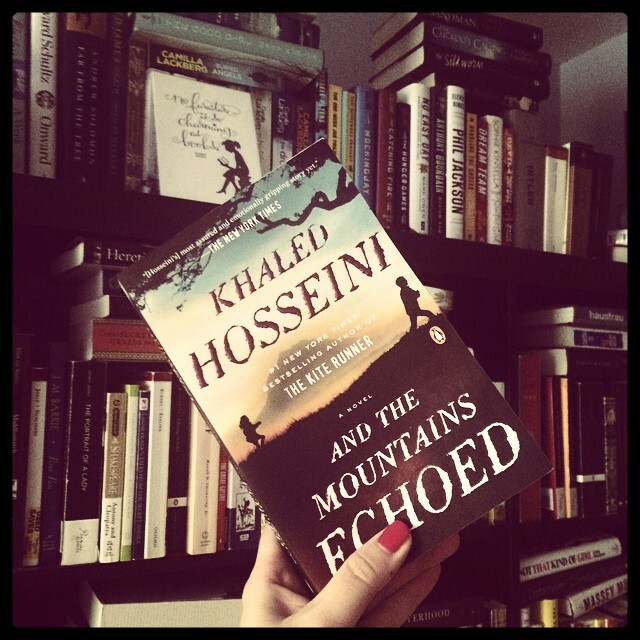 As ever with Hosseini’s books, this one takes place largely in Afghanistan. Hosseini knows his country’s history and uses it to flesh out the history of his characters. In many ways his country’s history is the most devastating story he tells. Unlike when I finished The Kite Runner and A Thousand Splendid Suns, I was not in pieces when I finished this book. There is no giant ending, no grand gesture to make it all worthwhile. This one ends with a whimper, an ode to all that could have been and wasn’t, a quiet kind of heartbreak. Great review Eva. You’re braver than me. I couldn’t go on with his books after the Kite Runner even though I have A Thousand Splendid Suns staring me down on the bookshelf. Maybe for next years’s TBR challenge? Definitely for next year’s challenge. A Thousand Splendid Suns is really good. A women centered story which I really appreciated. And his last one won’t have you tears, I don’t think. There’s nothing massively devastated, nothing that will leave you sobbing in the dark. So maybe start there? “Cherish the time you have with your loved ones because you don’t know when it will end” is always good to be reminded of, because it is way too easy to forget. Sometimes a good cry is cathartic. A Thousand Splendid Suns will definitely get the job done. It’s really easy to forget! There’s a whole storyline that follows this man as he grows up and away from his home. He doesn’t go home very often anymore and when he does this last time, his mom is suddenly old. And he realizes he wasted so much time away from her. Reading it is like Hosseini telling you to call your mom if you’re still lucky enough to have her! Aaah, I’ve had this book sitting in a pile for ages and haven’t read it yet. Your review reminds me I need to get around to reading it. I like the theme of this book about cherishing the ones you love.